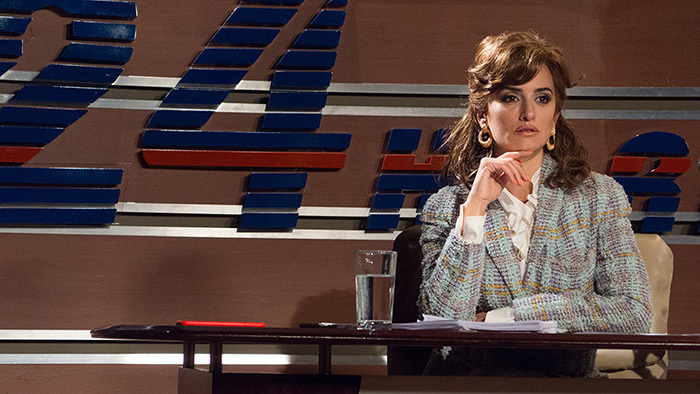 Greeted by the sight of armed men waiting for her as soon as she lands at Pablo Escobar's estate for a private party in 1981, when Colombian journalist Virginia Vallejo (Penélope Cruz) first meets her host (played by Javier Bardem), not only does she not recognize him, she fears that he's going to kidnap her for ransom. Explaining the guns away by saying that they're meant to protect guests from the exotic animals he has on his property, even though he doesn't abduct her outright, very soon it becomes clear that the married son of a poor farmer turned successful businessman has stolen Vallejo's heart. Though at the top of the list of Colombia's nouveau riche, we discover that at the time of their first meeting, very few people – outside of the Medellín Cartel, that is – knew precisely how Escobar and his associates acquired so much wealth so quickly. 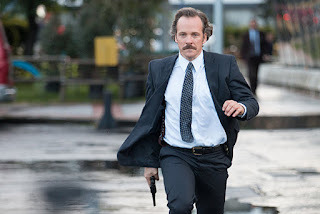 However, once he shows her one of his philanthropic endeavors to build housing for the poor and sees the children of the slums running through garbage just to get a glimpse of him, Vallejo decides that it's less important how he's made his money than how the man dubbed "The Colombian Robin Hood" uses it. Building up his profile on her television network to acquire enough fame and power to get elected to political office a year later, by now the source of Escobar's outrageous revenue has become increasingly obvious as, instead of "Robin Hood," the businessman from Medellín has become internationally known as "The King of Cocaine." And as Vallejo soon discovers, if anyone gets in his way, he either buys them off or has them killed. Based on Vallejo's bestselling 2007 memoir Loving Pablo, Hating Escobar which chronicled not only their romantic relationship but also corruption at the highest levels of the government of her country which, thanks to Escobar, became known as "the murder capital of the world," the film, written and directed by Spanish helmer Fernando León de Aranoa, takes some liberties for dramatic effect. And dramatic, as it turns out, is the key word for Loving Pablo, which is so over-the-top in places that – in the aforementioned scene wherein Vallejo lands on Escobar's property – before I discovered that Vallejo was a reporter, I simply assumed Cruz was playing a soap opera star who'd wandered over from the set of the latest film by Pedro Almodóvar. Speeding through more than a decade of complicated history, including international drug smuggling and corruption as well as the personal lives of Vallejo and Escobar, although Pablo uses subtitles to translate Spanish to English, I found myself wishing it also would've served up a timeline or a secondary documentary style voice-over to tell us where we are in the scheme of things. 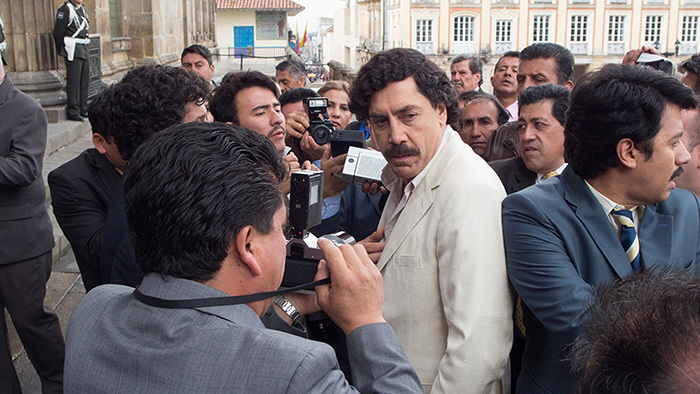 A longtime passion project of Javier Bardem, the Academy Award winning star (who also produced the film made by his Mondays in the Son director) shared in the film's production notes that he turned down the role of Escobar in a number of productions over the past twenty years because "they didn't invoke any feeling beyond a stereotype." 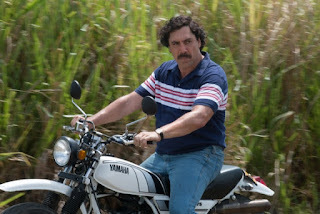 Though it's Vallejo's story overall, in Aranoa's adaptation of her memoir, we do indeed see several different sides to the figure as Escobar goes from a greedy up-and-comer climbing up the power ladder to a paranoid madman who barely reacts while his men use a chainsaw to remove someone's limbs in a private prison under his control. Yet while it's his real life wife, fellow Oscar winner Penelope Cruz, who steals the movie from start to finish, Bardem is predictably excellent in the role, in spite of his tendency in the first act to – like Marlon Brando in The Godfather – mumble so much as Escobar that we wish we had subtitles for him even when he's speaking English. Though fortunately we either become accustomed to the rhythms of Bardem's Escobarian mumbles to understand enough of his dialogue (or he learns to enunciate more clearly as Colombia's Robin Hood becomes a country conquering cocaine king), unfortunately the film's rushed storytelling and lack of cohesion damage the overall character arc. While most viewers with Netflix are more than familiar with Escobar via their acclaimed albeit gritty series Narcos, there's no denying Bardem's star power, especially in the final sequence leading up to Escobar's death, which is so compelling that you wish the rest of the movie had worked nearly as well. Fans of the two stars will enjoy watching the couple act opposite one another onscreen as Cruz manages to distract us from the film's hundred mile an hour pacing – elevating every scene she's in to the level of a high class soap – and practically winking at the audience alongside the always terrific Peter Sarsgaard's DEA Agent as if to say, "I've got this." 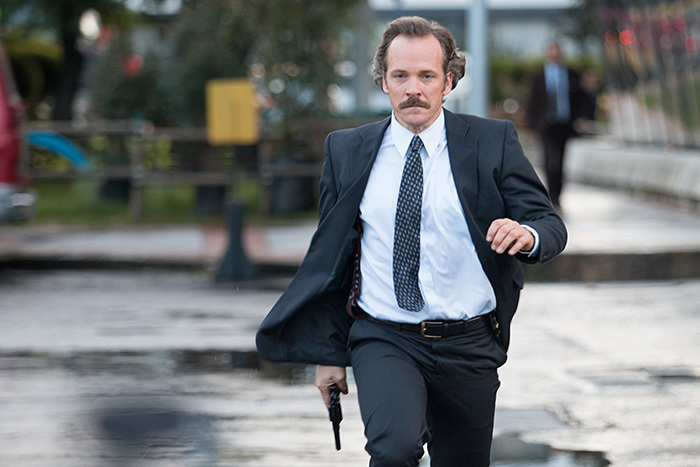 Criminally under-utilized, Sarsgaard might as well be playing a man named DEA Agent for all we actually know about what surely must be a composite character. Despite that, Aranoa manages to show us just what he's capable of as a director in a truly thrilling sequence early on in Pablo as a semi truck jackknifes across a Florida highway before a cartel plane lands right behind it and people in waiting vehicles hurriedly load its contents into vans and trucks nearby all to the tune of "Let it Snow." While the dark humor is right out of Scorsese, the scene itself is reminiscent of Doug Liman's underrated American Made, and once again illustrates just how good Pablo could've been with the right script and tone. Trying to tell a story that is far too massive and complex to be compressed into a 125 minute running time, although it's made with superior ingredients, including not only Cruz and Bardem but also a standout score by The Secret In Their Eyes composer Federico Jusid, in the end Loving's recipe never quite comes together as a whole. And while Aranoa's latest work isn't one I'd recommend rushing out to the theater to see, given its irresistible combination of sudsy drama and campy excess, Loving Pablo is sure to reach more viewers in its run on cable – holding those staying in on a Saturday night hostage with entertainment so over-the-top that you'll feel as though you've just gotten off the plane with Vallejo.